In a deep bowl take all the ingredients except the corn flour with about eight cups of water and cook covered on Medium power of 60 for 16 minutes. In a small bowl, mix the corn flour with some tablespoons of the chicken stock well and cook on high mode for 30 seconds. Then add this to the soup stock and cook on high for 3 minutes and serve while hot. Mix all the ingredients and cook on high for 6 minutes. Drain the liquid and keep aside and puree the mushrooms. Pour back into the liquid and cook on high for 3 minutes and serve while hot. Cook the tomatoes with some water in a bowl for 5 minutes on High mode and then place in cold water. Then remove the skin and puree it and drain for the seeds. In another bowl take butter, carrots, onion and celery and cook for 3 minutes at high. Puree the carrot mixture and mix with the tomato puree and the seasoning. Cook on high for 6 minutes. Serve with cream swirled on top. Mix back with the liquid and cook on high for 4 minutes and serve with croutons. Take oil, onions, green chilies, and garlic and cook on high for 4 minutes. Add the rest of the ingredients mixing well and cook on high mode for another 4 minutes. Take corn with ½ a cup of water and cook on high for 5 minutes till the corn is cooked. Take the potatoes with 2 cups of water and cook for 9 minutes on high while covered. Peel and dice the potatoes and allow it to cool. In a separate bowl mix well all the dressing ingredients, the potatoes and the corn and serve. Wash and soak the rice for about half an hour. Cook on high mode with power of 60 for 16 minutes while covered. Allow it to stand for 5 to 10 minutes and then serve hot. In a bowl take oil along with the seasoning and cook high for 3 minutes covered with a napkin or paper towel to prevent splattering. Cook the rice with 2 cups water on high for 16 minutes. Add the seasoning, coconut and salt with the rice and mix well. Stir the lemon juice with it and allow it to stand for 5 minutes. Serve while hot with plain coconut chutney or yogurt. Cook the rice with water on high for 16 minutes before which it should be soaked for sometime. Cook the mixed vegetables in ½ a cup of water for 8 minutes on micro 60. In another bowl take oil, onion, and chillies and cook on high for 4 minutes. Mix all the ingredients well in another bowl along with the salt and garam masala and cook for 5 minutes on high. Allow it to stand for 5 minutes and serve hot. Soak the rice for half an hour. In a bowl take oil and onions and cook on high for 3 minutes. Add turmeric powder, garam masala and the chickpeas and micro high for another 3 minutes. Add the soaked rice along with the water and cook for 16 minutes on high. Allow it to stand for 5 minutes and then serve hot. 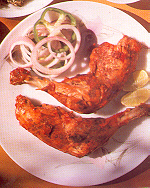 Cook the chicken, 1 tablespoon of water, curd, garam masala and salt at medium mode for 10 minutes. Add rice along with the required amount of water and cook on high for 16 minutes. Add the color on top and garnish with fried onions and serve hot. Take oil, cloves, cardamom and onions and cook on high for 4 minutes. Then add the prawns, tomatoes, ginger-garlic paste and the rest of the ingredients except the rice and cook for 5 minutes at high mode. Add the rice to the mixture then and cook on high for16 minutes more. Clean the chicken pieces and make small incisions. Then mix chilli powder, lemon juice and ginger-garlic paste and rub it on the chicken pieces and allow it to marinate for about 2 hours. Then mix the yogurt, dhania powder, garam masala, red color and salt and rub it on the pieces again and allow it to stand for another few hours. Preheat the oven at 200. Oil the grill and put the chicken pieces onto it. Cook on combination mode at 200 for 16 minutes and then on convection mode for 12 minutes at 200. Towards the end of the cycle baste with the butter on both the sides. Serve with onion rings, lemon wedges and sprinkled with chaat masala. Cook the fish with one tablespoon of water on high mode for 6 minutes. Mash it and mix it well with the rest of the ingredients. Make into small balls and flatten them brushing the top with oil. Grill on convection mode for 10 minutes at 200 turning them once in between. Mix the prawns, lemon juice, ginger-garlic paste, chilli paste, salt, pepper and oil well. Marinate the mixture for at least an hour. Pre-heat the oven at 200 and cook on combination mode for 10 minutes at 200. Serve with lemons and mint chutney. Place the fish on a flat dish. Scatter the lemon pieces over the fish and sprinkle salt and pepper. Pour the wine and the water over it and cook on high for 8 minutes. Mix oil, ginger-garlic paste, chilli power and curd and cook on high for 5 minutes. Add the chicken and 2 tablespoons of water, cover and cook on high for 3 minutes. Add cashew paste, garam masala and salt and cook at 60 for 12 minutes. 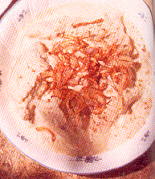 Add cream and garnish with the fried onions and sprinkle garam masala. Take ½ teaspoon oil, cloves, cardamom and Bay leaf and cook on high for 3 minutes. Add the masalas and cook on high for another 1 minute. Add the tomatoes and cook on high for 2 minutes. 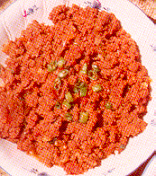 In another bowl mix oil and the minced meat with ½ a cup water and cook on high for 3 minutes. Mix the onion and masala mixture to this and cook covered at 60 for 14 minutes. Garnish with coriander and garam masala before serving. Take the chicken, butter, salt, pepper and herbs in a shallow dish and cook on high for 14 minutes. Take the juice of the cooked chicken along with the butter and cook on high for another 30 seconds. Then add the wine, salt, pepper and butter and cook on high for another 30 seconds. Then add the wine, salt, pepper and flour together and cook on high for 1 minute. Pour this onto the chicken along with the orange juice and cook on high for 2 minutes and serve hot. Take the prawns and garlic in a flat dish and cook on high for 1 minute. Add the rest of the ingredients and cook covered on high for 8 minutes. Stir when the process is half way through. Allow it to stand for some 5 minutes and then serve. Mix well the butter, coriander, garlic, red chilli powder, and mint and marinate the mutton pieces in it for one night. The next day rub the mutton tikkkas with the hung curd and garam masala and keep for a few hours. Pre-heat the convection oven at 200 degrees. Place the mutton pieces in the grill tray and cook on combination mode for 16 minutes at 200 degrees. Then brown it on convection mode on 200 degrees for 5 minutes. Remove and spray chat masala over it along with lemon juice and serve with onion ringlets. Wash and make 3 or 4 deep incisions on the fishes. Mix the rest of the ingredients well and rub the fishes with the paste and allow it for 1 hour. Place one fish at a time onto the oven and cook covered on medium high of 80 for 12 minutes. Turn the fish while mid-way through the cycle. Repeat with the second fish, till the fish is crisp. 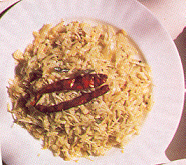 Serve hot with chat masala and lemon juice. 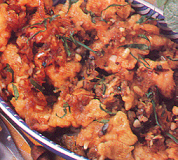 Marinate the fish with the red chilli powder, ginger-garlic paste, tamarind paste, turmeric, green chillies and salt. Keep for ½ an hour. In a large bottom dish take the oil and add fish and cook covered for 3 minutes on high mode. Turn the fish over and pour the coconut milk over it and cook covered on medium high of 70 for 14 minutes. Rub the chicken with the salt and turmeric and keep aside for ½ and hour. In a dish take oil, mustard seeds, and cook covered with a paper towel on high for 1-½ minutes. Add dal, fennel, red chillies and cook on high for another 2 minutes. Add onions and cook for 3 minutes. Mix the chicken, ½ cup water and cook covered on medium power of 60 for 14 minutes till the chicken is well cooked. Marinate the cauliflower with the ginger-garlic paste, lemon juice, and chilli powder and keep for few hours. Mix the curd, garam masala and salt and rub it on the cauliflower and keep for a few more hours. Pre-heat the convection oven on 200 degrees and cook on combination mode for 200 degrees. Brown further on 200 degrees for 5 minutes. 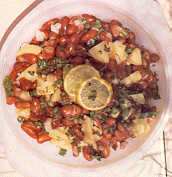 Serve sprinkled with chat masala and lemon juice. Mix the mushrooms with all the ingredients except the coriander. Keep aside for around 30 minutes. Pre-heat the oven at 200 degrees and put the mushrooms on the wire rack and cook for 10 minutes, basting occasionally. Mix all the ingredients and cook on power 70 for 8 minutes. Mix all the ingredients into a paste and coat the paneer pieces with it. Pre-heat the oven at 230 degrees and cook on convection mode at 200 degrees for 12 minutes. Serve with lemon juice and chaat masala. Soak both the dals overnight. Grind the dals with curd, sugar, salt, ginger, and asfoetida and green chillies. Add the rest of the ingredients except the lemon juice and soda and leave for about 12 hours. Then add the lemon juice and soda and steam on power 48 for 9 minutes and allow it to stand for 5 minutes. In another dish take the oil, rai, curry leaves, and cook covered on high for 1 minute. Add this to the steamed dhoklas and serve with chopped coriander. Mix all the ingredients well and cook on high mode for 6 minutes to get Palak Paneeer. Boiled Peas can be added to this to get matter palak paneer. In a dish take oil, mustard seeds, red chilli and curry leaves and cook covered on high for 2 minutes. Grind the coconut, green chilli and spring onions to a paste and cook on high for 2 minutes. Add the cabbage and cook on power 70 for 8 minutes till the cabbage is cooked. Slice the head of the capsicums, de-seed and apply salt on the inside. Take a bowl half filled with water and boil the capsicums in it at high for 8 minutes. In another dish, take oil, green chillies, and onions and cook on high for 3 minutes. To this add the mashed potatoes, cheese, limejuice, turmeric powder and salt and mix well. Fill the mixture into the capsicum cups and garnish with fresh coriander and cook on high for 6 minutes and serve hot. Take the suji in a plate and roast it on high for 3 minutes, stirring in between till brown. Take the oil, mustard seeds, coriander seeds, and curry leaves in a separate bowl and cook covered on high for 3 minutes. Add the onions and cook for another 3 minutes. Add to this the potatoes and cook on high for another 5 minutes. Then add green chillies, coconut, peanuts, salt and suji and one-cup water and cook on high for 5 minutes. Soak the rice and the dal for 2 hours. Grind the rice and the dal separately. Mix both the pastes along with a little salt and allow it to ferment overnight. Grease small bowls and pour the batter into them and place them in a circular way in the turntable. Cook on high mode for 2 minutes. Repeat the procedure for the rest of the batter. Cut the head of the tomatoes and scoop out the pulp inside. Mix the pulp with the rest of the ingredients and fill in the tomatoes. Top the tomatoes with a bit of cheese and cook on high mode for 4 minutes. Trim the bhindis and make a slit in each one of them. Mix all the masalas mentioned above and fill into each bhindi. In a dish take the oil and onions and cook on high for 3 minutes. Add the bhindis, mix well and cook on high of power 70 for 10 minutes till the bhindis are tender. In a dish cook the oil along with the cumin seeds, covered on high mode for 1 minute. Add the ginger and cook on high for another 30 seconds. Add the rest of the ingredients and cook on power of 60 for 16 minutes. Garnish with chopped coriander and serve. Take oil, ginger, garlic paste and onions and cook on high for 4 minutes. Add the rest of the ingredients except the yoghurt and cook covered for 3 more minutes. Add the curd and one tablespoon of water. Cook on medium power of 60 for 14 minutes till the turnip is well cooked. Garnish with chopped coriander leaves and garam masala and serve. ½ teaspoon, a mixture of 5 spices. Take oil in a dish and cook on high for 30 seconds. Add the panch phoran, and dried chilli and cook covered for 2 minutes till the seeds sizzle. Add the ginger and cook for another 1 minute. Add the rest of the ingredients along with the dried apricots and cook on power of 60 for 10 minutes.